Bennie Moten (November 13, 1894 – April 2, 1935) was an American jazz pianist and band leader. 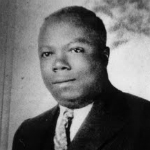 He lead the Kansas City Orchestra, the most important of the regional, blues-based orchestras active in the Midwest in the 1920s, and helped to develop the riffing style that would come to define many of the 1930s Big Bands. They signed with Victor Records in 1926, and were influenced by the more sophisticated style of Fletcher Henderson. More often than not, their pieces featured a hard stomp beat that was extremely popular in Kansas City. Moten continued to be one of Victor’s most popular orchestras through 1930. Their final session showed the early stages of what became known as the “Basie sound”, four years before Basie recorded under his own name.